Undercounter Dishwashers at Adexa Direct - a leading supplier of catering & kitchen equipment in the UK offering the largets range, free shipping and unbeatable prices. Clean dishes efficiently with a space-saving commercial under counter dishwasher. An under counter dishwasher is a great option for small dining facilities, like bars and cafes, that need to clean dishes quickly. These dishwashers are available with several options, allowing you to choose one that can handle the amount of racks per hour that your establishment needs to clean. 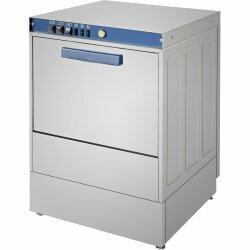 All caterers require a reliable and dependable professional undercounter dishwasher like this one, l..
All caterers require a reliable and dependable professional dishwasher like this one, lasting over m..
High quality, premium and fully equipped professional undercounter dishwasher for hotels, bakeries, ..